The basic rules of a casual shuffleboard game are easy. 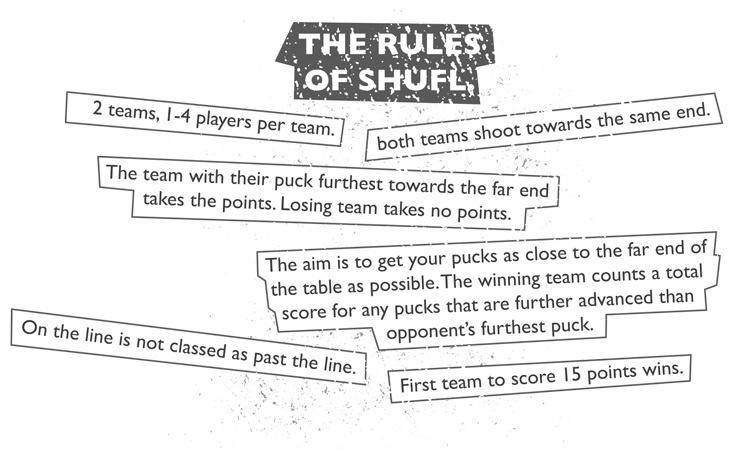 The rules below will be enough for your fun game, pub tournament or games evening with friends. 1. 2 teams, 1 - 4 players per team. 2. Both teams shoot towards the same end. 3. The team with their puck furthest towards the far end takes the points. Losing team takes no points. 4. The aim is to get your pucks as close to the far end of the table as possible. The winning team counts a total score for any pucks that are further advanced than the opponent's furthest puck. 5. 'On the line' is not classed as 'past the line'. 6. First team to score 15 points wins. These are the official tournament rules developed by the global administrating bodies of the sport. They cover playfield management, player technique and equipment specification, in plenty of detail. If you take your shuffleboard seriously, you'll need to read up on these. Read official shuffleboard tournament rules.